After months of rumors and speculation, the Atlantic 10 has officially added yet another hoops power, this time the VCU Rams from the Colonial Athletic Association. The school called a press conference today to make the announcement. 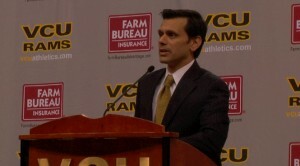 There, VCU President, Dr. Michael Rao, informed the crowd that the move would take effect July 1, meaning VCU will compete in all A10 sports next fall, including one year with outgoing members Temple and Charlotte. By leaving the CAA, VCU will forfeit as much as $5 million in NCAA tournament shares owed, a loss President Michael Rao was willing to swallow, going on to say, “the expected returns are far greater than the short-term losses”. Rao also commented on the Universities desire to be “premier across the board…and that includes athletics”.